When facing recuperation following surgery, illness or injury, you need to be confident about your choice for rehabilitative and post hospital care. At Golden View, our in-house therapy department consists of experienced, licensed professional therapists who work closely with individuals, their family, nurses and doctors to develop and implement tailored treatment plans. 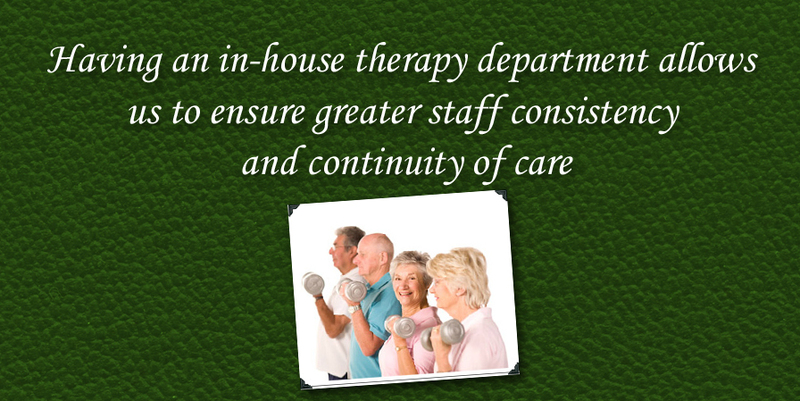 Having an in house therapy department allows Golden View to ensure greater staff consistency and continuity of care. Click here for descriptions of our therapy services. Here at Golden View, each treatment plan is customized for optimal outcomes, to accelerate recovery whenever possible, and with the flexibility to afford individuals progressing more slowly with the opportunity to receive extended care and therapy to facilitate a safe and successful transition to home. Golden View’s partnership with the orthopaedic practice Advanced Orthopaedic Specialists (AOS) enhances the professional care provided by the in-house rehabilitation and skilled nursing program. These collaborative efforts allow area residents a local choice for quality post-hospital care close to home, their family and friends. Through our partnership with AOS, we can provide orthopaedic oversight, program development, staff support and enrichment, and on-site consultation services that connect surgeons, patients and your team of healthcare professionals. Golden View now offers pre-operative planning with your own transitional health care coordinator, offering patients peace of mind, the opportunity to see a room, ask questions and meet the staff. In preparing for your stay, our professional staff verifies and coordinates insurance coverage while working with hospital care managers, your physicians and family to ensure a worry free transition to our Meredith campus. Preparing to return home starts on admission. Our staff takes the time to review new and old medications, provide education regarding your medical status and the encouragement to make sure you get there. 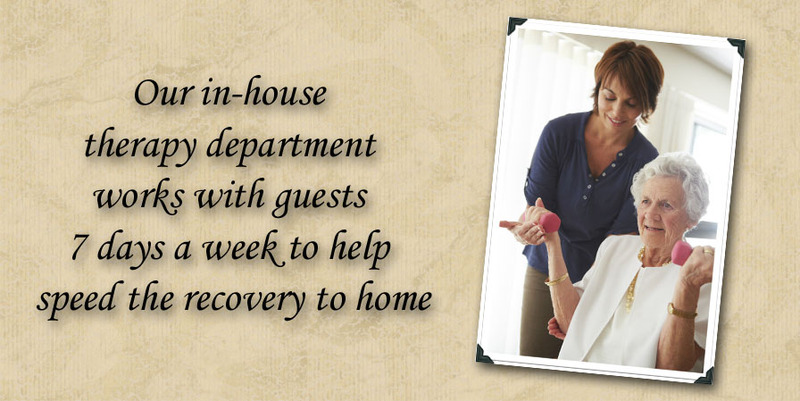 Our staff also makes referrals and coordinates community services for continued support at home. But remember, even after you return home we’re still here to answer questions and support you in whatever way possible. You can depend on us. 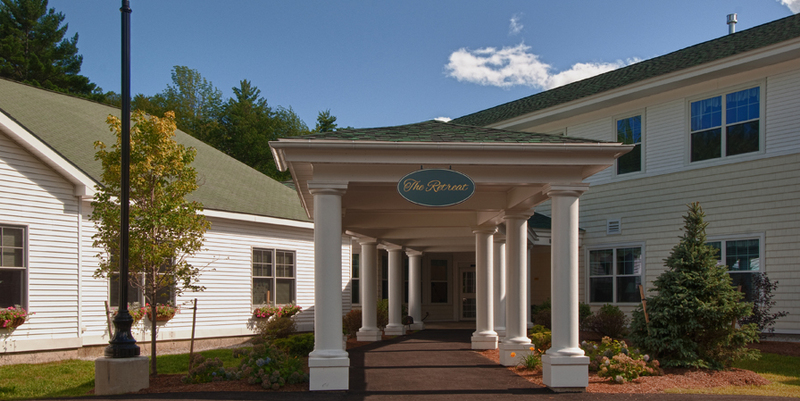 Whether you’re an assisted living resident at The Inn, The Terrace, or The Cottage, a long-term living resident or just visiting for short stay respite care, you still have access to our in-house licensed professional therapists should the need arise. These therapy services may be covered by Medicare or another third party insurance, and don’t worry, our business office is available to help determine and coordinate coverage.